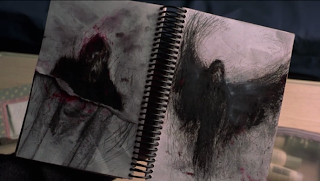 Today, the "true story" horrors of 2002's The Mothman Prophecies. 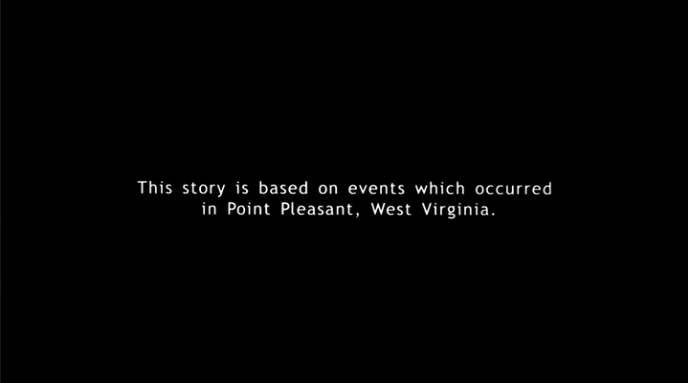 Based on the sort of "true events" that I personally give no credence to, The Mothman Prophecies centers on John Klein, a journalist for The Washington Post whose experience with the supernatural begins when his wife sees a strange vision that causes her to crash their car. Taken to the hospital, his wife is diagnosed with an inoperable brain tumor, which may explain away her vision of an unearthly being as a hallucination caused by her illness. She spends her final hours drawing pictures of the thing she saw, some sort of winged creature. Two years after his wife's death, Klein is taking a drive through Virginia when he loses time, or more accurately he loses miles, finding himself way off course, travelling a long distance in an impossibly short amount of time, ending up in the small town of Point Pleasant, West Virginia. It can't be a coincidence that some of the town's residents have been reporting sightings of a creature with a description eerily similar to one Klein's wife said she saw, and when Klein finds out about that he kicks into investigative reporter mode and teams up with a local police woman to try to figure out what's going on. The sightings aren't the only strange things going on in Point Pleasant. One man says that Klein has been knocking on his door nightly, days before Klein actually arrived in town. Others have been receiving weird phone calls. Some of the townspeoples' experiences cause damage to their eyes and ears. Contact is made by a mysterious man who gives his name as Indrid Cold, a man with psychic abilities who claims to be in touch with Klein's late wife, who makes some appearances around Point Pleasant herself. Sightings of the "mothman" have occurred soon before disasters all around the world, and the "Prophecies" part of the title comes into play when Indrid Cold starts predicting catastrophes and their bodycounts. Cold tells Klein one of his vague predictions, something that will happen on the Ohio River, and Klein attempts to stop the event, whatever it may be, before it's too late. 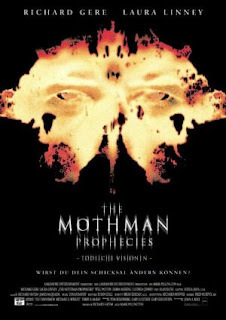 The Mothman Prophecies has its share of fans, but for me, when I first saw it on DVD in 2002, it was a "one and done" type of movie. I watched it, it was alright, I had no desire to see it a second time, and over the past ten years I have never felt the need to revisit it. Now that I have watched it again for SHOCKtober, I feel much the same way about it. I think it's a decent enough movie, it's just not something that I need to watch multiple times. The story is interesting, the film is well shot, and there are some effectively creepy and/or suspenseful moments, but I do think the movie runs too long at 119 minutes. One area of disconnect for me is the fact that the movie stars Richard Gere, whose screen presence doesn't really appeal to me. He does get some strong support from Laura Linney as Point Pleasant police officer Connie Mills and Will Patton as beleaguered local Gordon Smallwood. The source material for the film is a 1975 novel by John A. 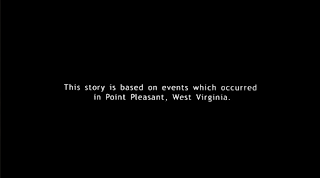 Keel, in which he reports on the real life sightings of the Mothman in Point Pleasant, West Virginia, and in Ohio locations across the river from Point Pleasant, in 1966 and 1967, building up to the same event that serves as the climax of the movie. Despite that, the movie is set in modern day. It might actually have been more interesting to me if they had made it as a period piece... with a different actor in the leading role... playing a character more relatable than a high profile D.C. reporter... As it is, I think I'm done with The Mothman Prophecies again, for another several years at least.